Double. After we had scrutinized the GeForce GTX 680M SLI a few weeks ago, an SLI configuration of two GTX-670MX-GPUs had to face up to our benchmarks. 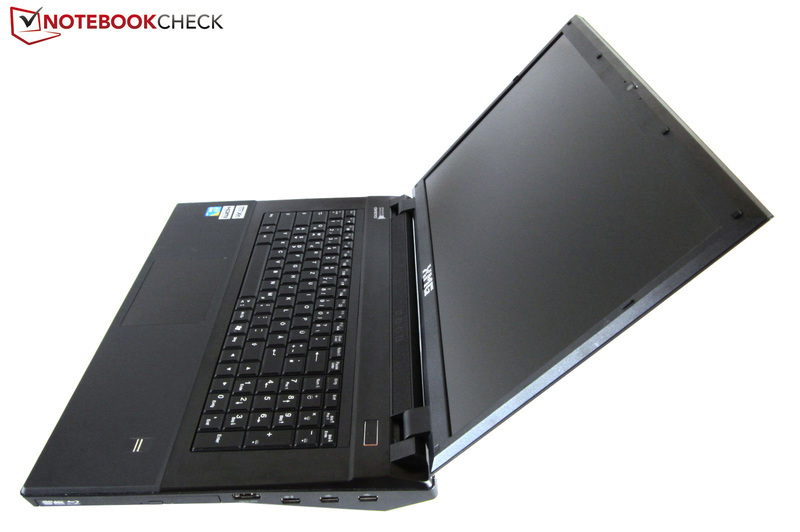 Deviltech was the first manufacturer to deliver such a 17-inch notebook. The curtain rises on the hell machine. The HellMachine lives up to its name. The desktop replacement available from 1489 Euros (~$1960) upwards, is mainly aimed at avid gamers. It is based on the 419 x 293 x 54 mm (~16.5 x 11.5 x 2.1 inches) big and nearly 4 kg (~8.8 pounds) heavy Clevo-P370EM barebone, which we had already reviewed in the form of Schenker's XMG P722 PRO. Deviltech offer a wide range of configuration options. Except for the display (17.3-inch non-glare) nearly all components are customizable. Deviltech install either the tried and tested Windows 7 or the brand new Windows 8 operating system. We appreciate that operating system and keyboard are available in different languages. 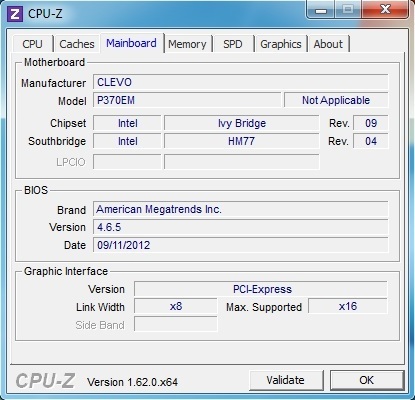 As expected, the processors stem from Intel's popular Ivy Bridge generation. In addition to the Core i7-3630QM (2.4 - 3.4 GHz) also the more expensive Core i7-3740QM (2.7 - 3.7 GHz) and Core i7-3840QM (2.8 - 3.8 GHz) models are offered. 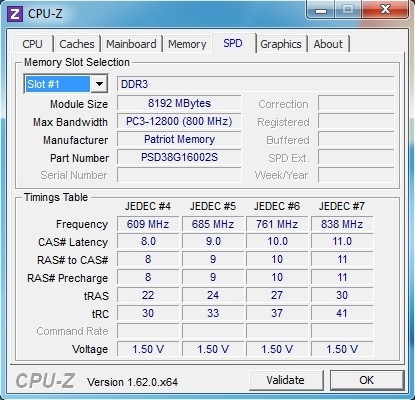 The DDR3 RAM varies from 4 to 32 GB (4 slots). Depending on the type, mass storage capacities of up to 120 or 1000 GB are possible (two 2.5-inch slots). The graphics solution is either a single GeForce GTX 680M or a dual GPU configuration of two GTX 670MX or two GTX 680M graphics adapters. A Blu-ray burner, a Blu-ray combo drive or a standard DVD-burner handle optical media. The default WLAN card can be replaced by a better module for a surcharge (Killer Wireless-N). Our test sample, which is equipped with a Core i7-3630QM, a 120 GB SSD, 8 GB RAM, Windows 7 Home Premium 64-bit and the GTX 670MX SLI solution, is currently priced at 1640 Euros (~$2159). As we already pointed out, the case equals the Schenker XMG P722's. So we will skip the section on case, connectivity and input devices and directly start with the display. The matte 16:9 Full HD panel is referred to as Chi Mei N173HGE. Some readers of several gaming notebook reviews might recognize this name. 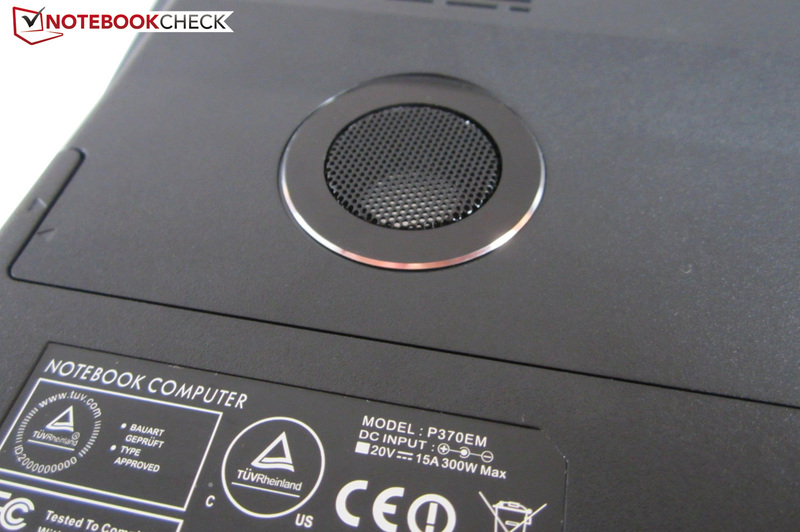 Besides Clevo, MSI also frequently installs this display (see e.g. GE70 or GT70). 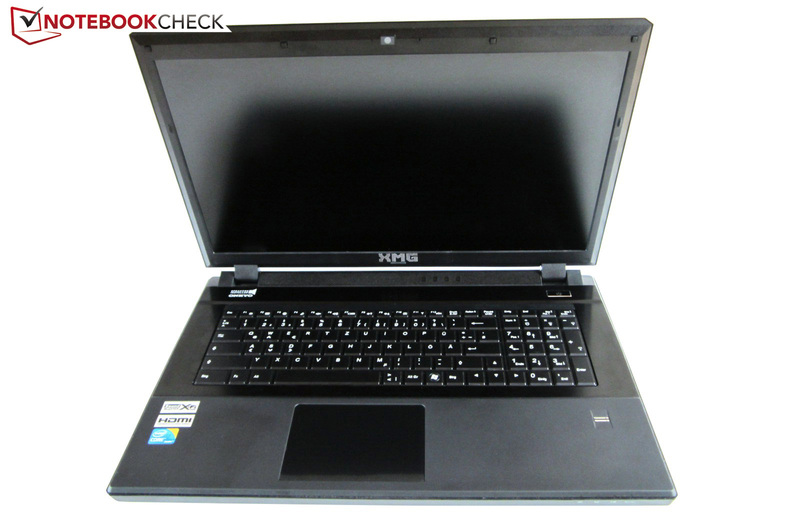 Likewise, Asus like to employ this model (e.g., in the G75VW and N75SF). As the Chi Mei N173HGE's image quality is rather high-end, this is no surprise. The panel deserves praise for its good brightness. 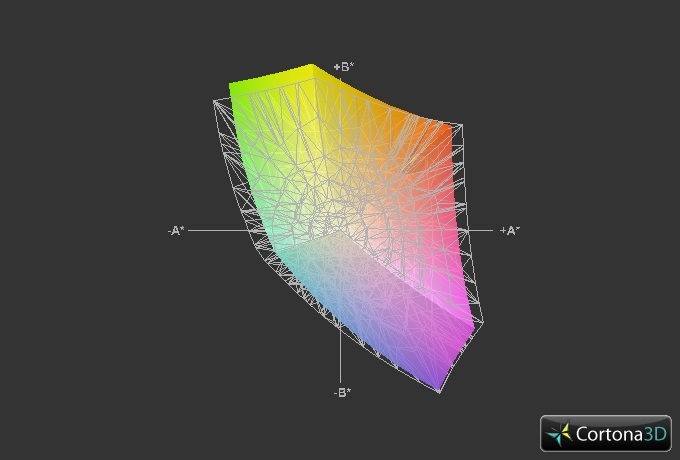 According to our measurements with the X-Rite i1Pro 2, we calculated an average of 270 cd/m². The subprime brightness distribution (~83 %) does not have a negative impact in practice, however, the low black value (~0.4 cd/m²) is perceptible. Compared to ordinary panels, dark elements appear significantly less grayish. While this is hardly important for office and Internet tasks, it is easily recognizable in entertainment media. Problem: Nvidia graphics cards and the N173HGE are not an ideal fit. Some users will be bothered about the horizontal stripes often occurring in dark scenes, especially in horror films and shooters (Alan Wake, Metro 2033 etc.). Although the image looks normal most of the time, Clevo should consider a change. 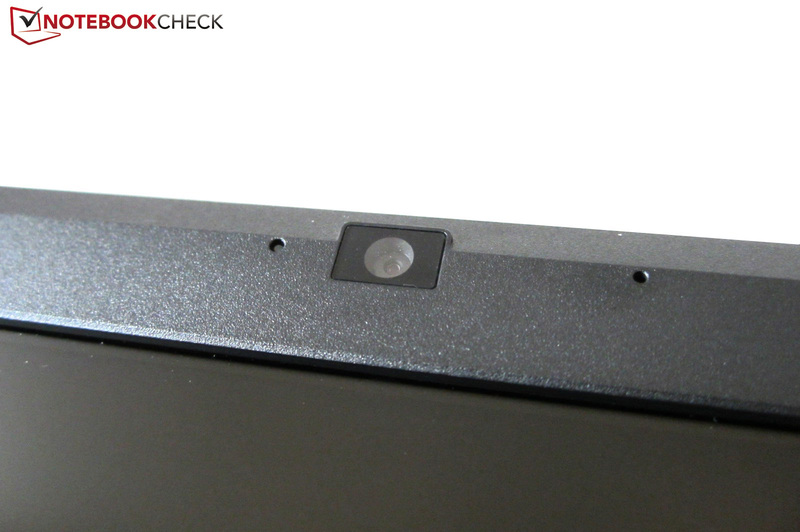 The AU Optronics B173HW01 V5 in the previous test model did not suffer from this problem. The display performs pretty well in the remaining aspects. While inferior panels achieve a contrast of about 200:1, the Chi Mei nearly reaches 700:1. Moreover, the color coverage (sRGB coverage is quite good) is decent. So, the image looks vibrant. Due to the anti-reflective surface and the decent brightness, the notebook gives a great experience outdoors. There is little to complain about regarding the viewing angles. 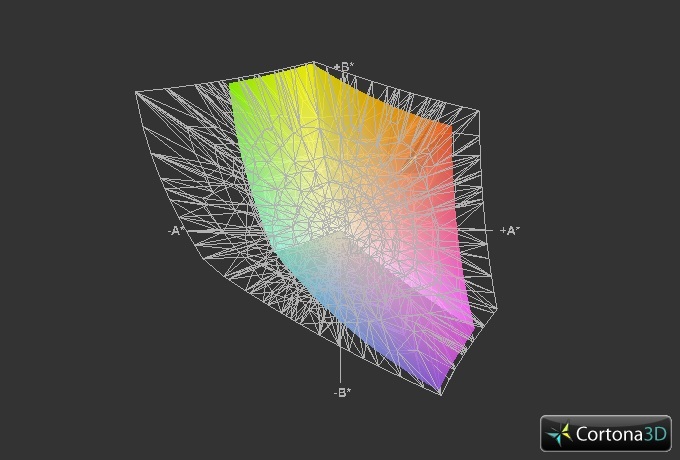 The figure below shows that the user hardly experiences any shifts in display color in the horizontal direction. As it is a TN panel, it does not score that well in the vertical direction. The image either looks too bright or dark from an oblique angle. To meet demands for high performance, Deviltech equip the HellMachine with a powerful quad-core CPU. Because of its decent price-performance ratio we opted for a Core i7-3630QM. This high-end CPU contains 1.4 billion transistors and, like all other Ivy Bridge models, it is manufactured using 22 nm lithography. In contrast to the more expensive Core i7-3840QM it only houses 6 instead of 8 MB L3 cache. Typically Intel, the present processor generation supports a lot of features. In addition to Hyperthreading (simulates virtual cores) the Turbo Boost technology is especially interesting. 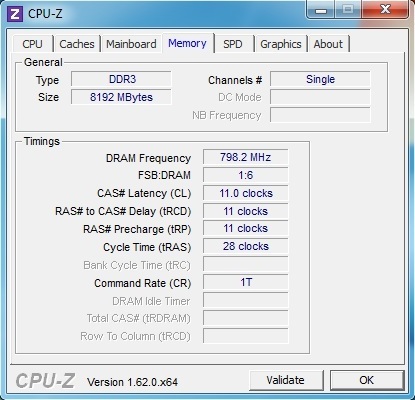 The base clock is automatically increased by several 100 MHz under load. The Core i7-3630QM supports a maximum of 3.4 GHz. 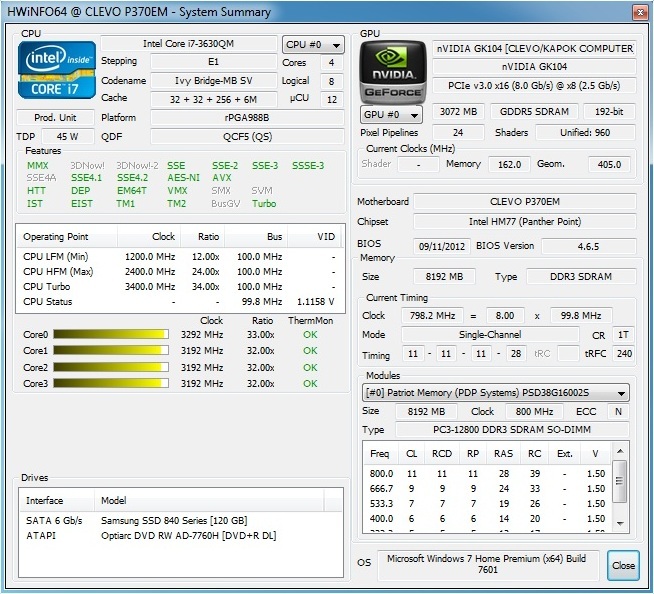 The TDP of 45 Watts exceeds the average of notebooks (dual-core CPUs: maximum of 35 Watts). Because of SLI compatibility the HD Graphics 4000 cannot be used. We will analyze whether it is worth buying a more powerful CPU model by means of several benchmarks. The Turbo Boost technology is not limited in any way. 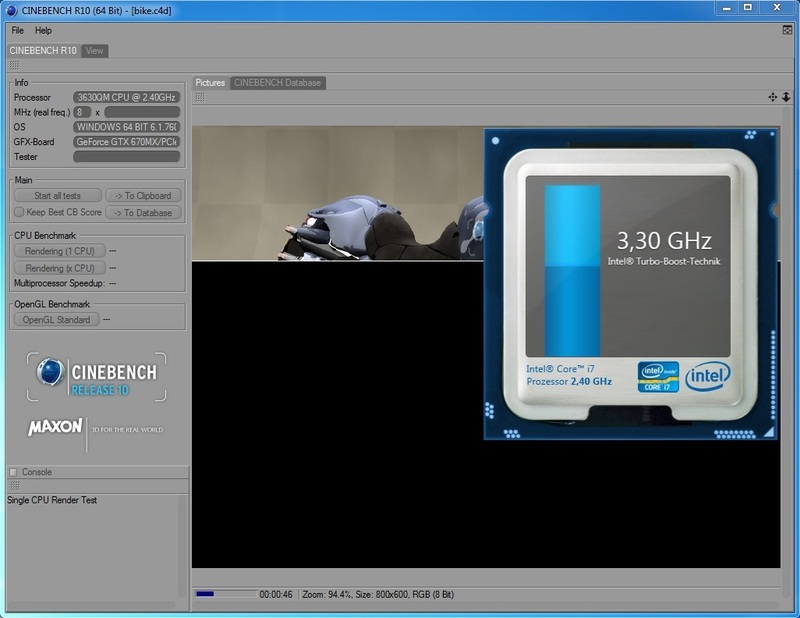 The processor achieves about 3.3 GHz in single core rendering and about 3.2 GHz in multi-core rendering of Cinebench R10. 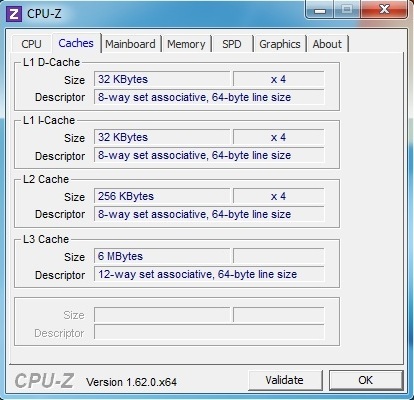 Moreover, the clock rate also easily exceeds the 3 GHz mark in demanding scenarios. 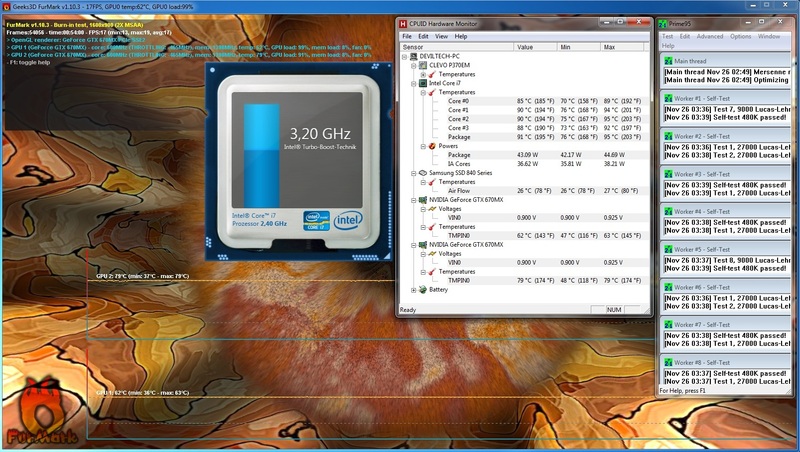 Even during the stress test the Intel monitor displayed an average of 3.2 GHz. 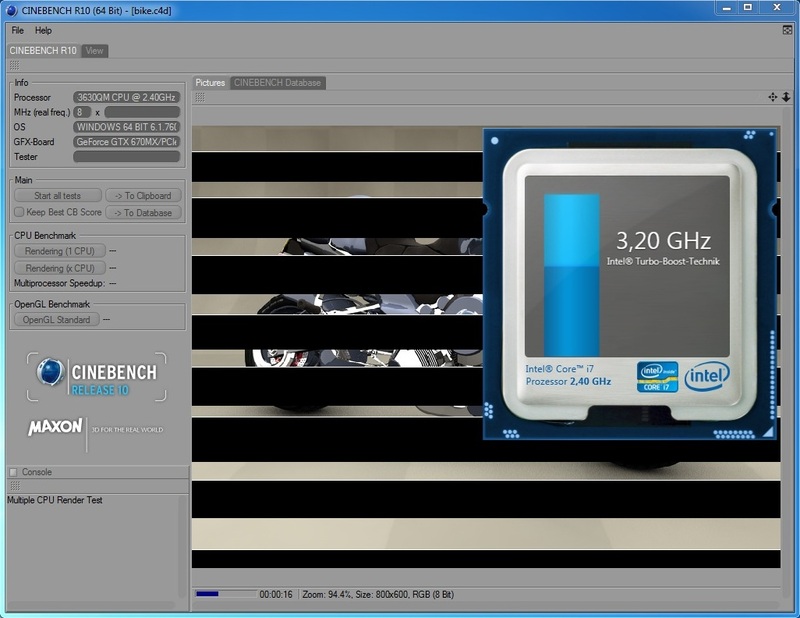 The Cinebench R11.5 attests the Core i7-3630QM as an excellent performer. 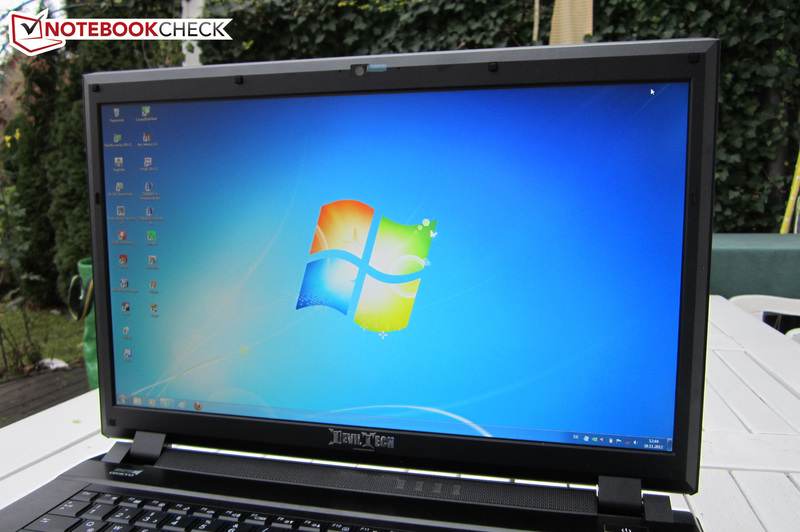 In achieving 6.46 points the quad-core CPU calculates about twice as fast as its Core i5-3360M dual-core brother (3.25 points @ Dell Latitude E5530) in the multi CPU test. 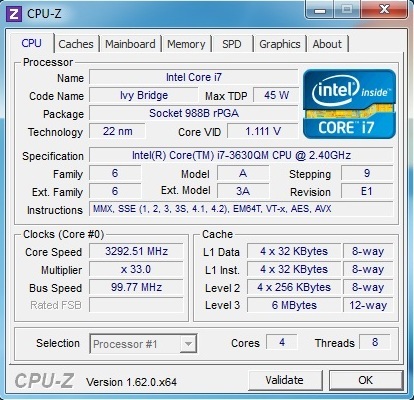 Compared to the Core i7-3740QM our Ivy Bridge model is nearly 7 % (6.93 points @ One M73-2N) slower. 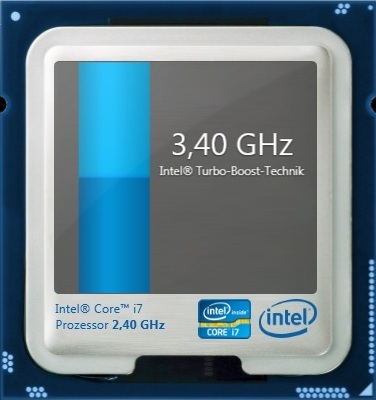 The Core i7-3840QM is about 10 % faster (7.15 points @ One M73-2N). In our opinion the small performance gain does only partly justify the big surcharge. 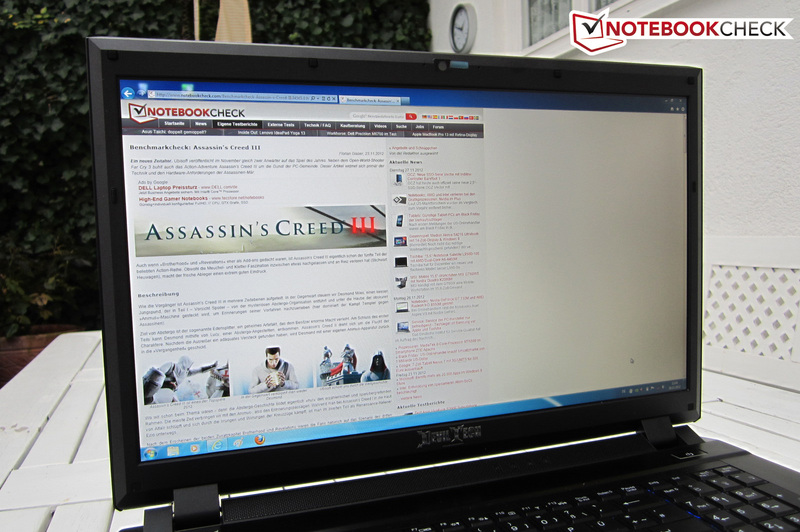 As the graphics card is the limiting factor in games, gamers will already be contented with the Core i7-3630QM. The results of Cinebench R10 are available in the table below. Dual GPU solutions like the GeForce GTX 670MX SLI are controversial. They improve the performance: If the GPU driver supports an appropriate profile, the frame rates can sometimes increase by up to 80 to 100 %. But, high waste heat and huge energy demands requiring a good cooling system and a big power supply are negative aspects. The HellMachine comes with a 1.6 kg (3.5 pound) 300 Watt power supply. 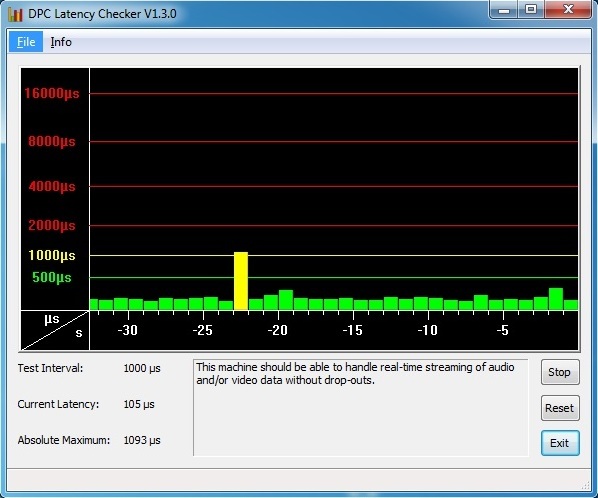 Another problem is micro stuttering. Sometimes time intervals between images are large enough that movements no longer appear to be smooth to the human eye. In extreme scenarios games look smoother on single card systems. 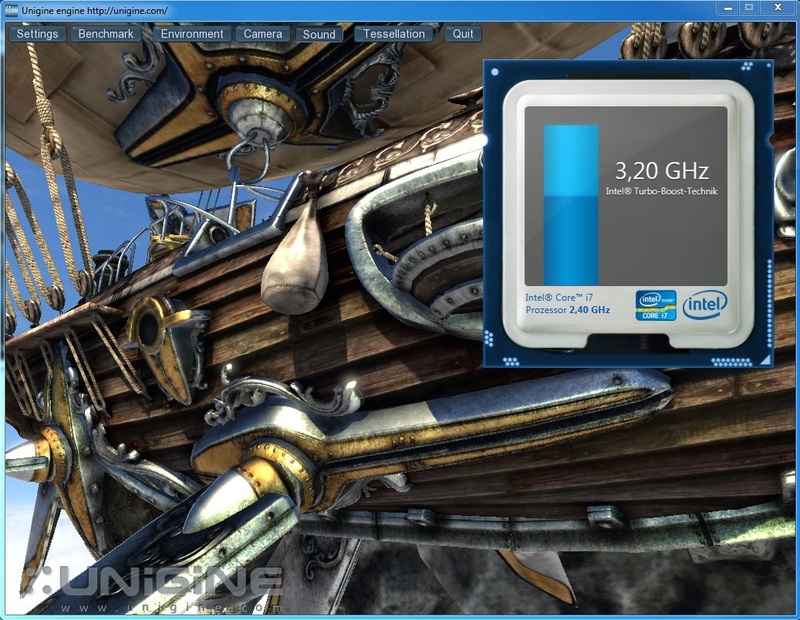 Moreover, 3D programs can run even slower in SLI if the application does not specifically support it. This is currently true for Need for Speed: Most Wanted. Fortunately, Nvidia offers a handy update function. Regardless of the upgrade, we recommend checking whether Nvidia made a completely new version available after some weeks. The beta driver 310.61 used in the benchmarks installs without troubles. Technically, the GeForce GTX 670MX is based on the modern Kepler architecture, which uses 28 nm lithography. The clock rates of 600 and 1,400 MHz (core/memory) are a little lower than the GTX 670M's (598/1,500 MHz), which, other than its name would suggest, belongs to the older Fermi generation and uses 40 nm lithography. Due to more shaders (960 vs. 336, not directly comparable) and more transistors (2.54 vs. 1.95 billions) the GTX 670MX is nevertheless faster while the Kepler GPU is, as expected, slower than the GeForce GTX 675M. The Fermi model also scores points because of its wider interface (256 vs. 192 Bit). However, it is a different story, how a dual GPU solution of two GTX 670MX cards performs. Can the Kepler model in SLI mode maybe even best Nvidia's flagship, the GeForce GTX 680M? Our benchmarks will provide the answer. In modern DirectX 11 benchmarks the second graphics card significantly increases the performance. In achieving 7,042 points, the Kepler team is about 95 % faster than a single GTX 670MX in 3DMark 11 (GPU-Score @ performance preset). Likewise, the GeForce GTX 680M does not stand a chance against the SLI combo scoring 5,967 points (Deviltech Devil 6700) which is slower by 15 %. The differences in the Unigine Heaven 2.1 benchmark (1280x1024, high, tessellation normal) are similarly high. While a GTX 680M laptop achieves about 74 fps (Schenker XMG P702), the test sample is 18% faster (87.2 fps). 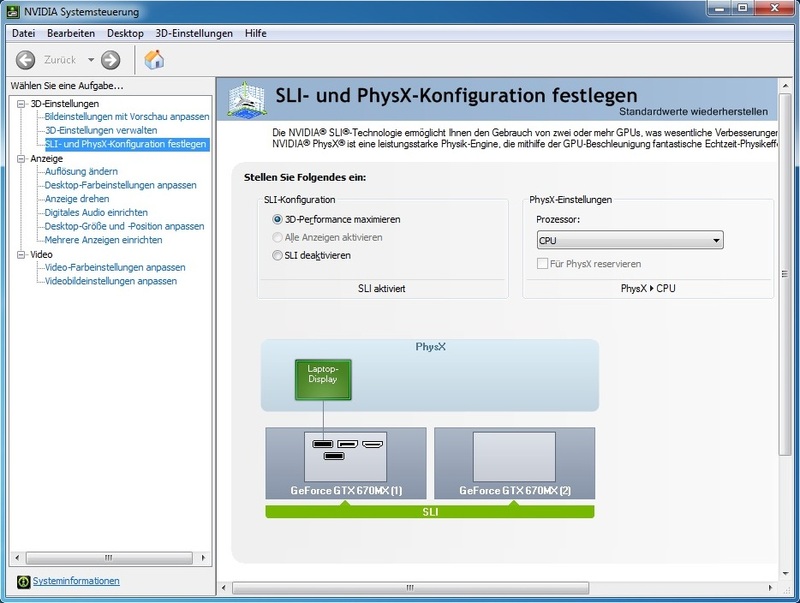 If SLI is deactivated, the frame rate of the GTX 670MX is about 50 % lower (46.5 fps). 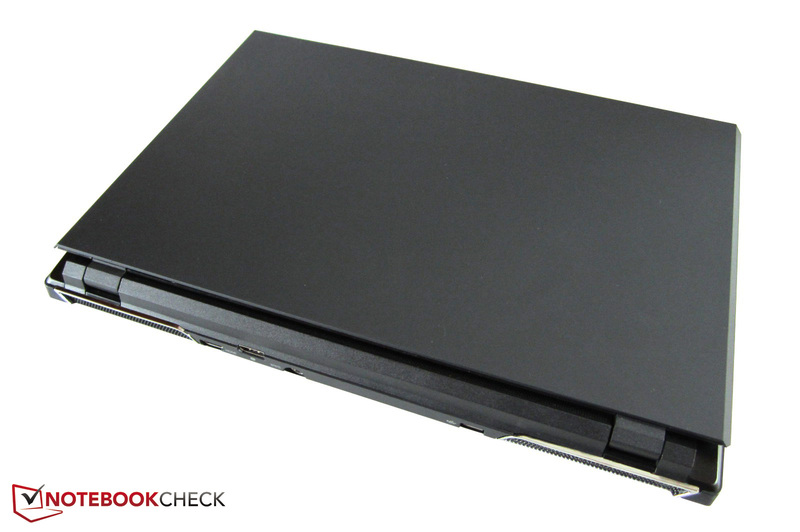 The 120 GB model of the brand new Samsung SSD 840 delivers mixed performance. Let's start with the positive aspects: In sequential reading the seven mm flat SATA-III model does not only outperform its SSD 830 predecessor (505 MB/s @ One M73-2N), but also the popular Crucial Real SSD M4 (489 MB/s @ Gigabyte U2442N). 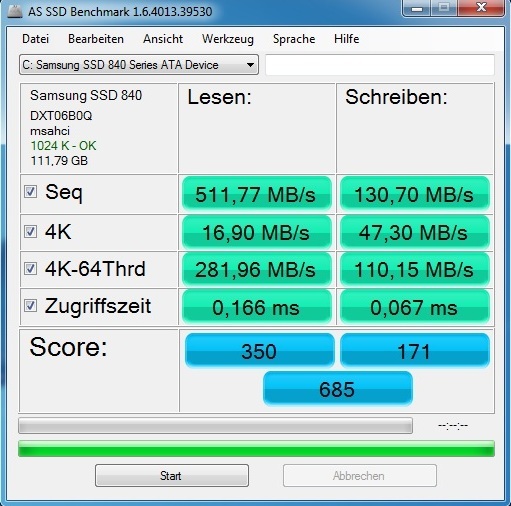 512 MB/s in the AS SSD benchmark suggest a great performance. It's a pity, that the results in the writing tests are anything but outstanding. In achieving 130 MB/s it is significantly slower than the RealSSD M4 (~200 MB/s) and the SSD 830 (~330 MB/s). But, the access times are rather decent. 0.08 ms in writing can only be bested by a few competitors. 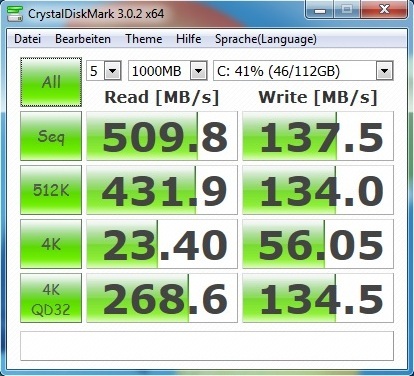 Overall, the performance of the Samsung SSD 840 is decent. Windows appears to run significantly slower with an HDD. You'll soon learn to appreciate the advantages of the SSD technology (shorter boot, load and transfer times). It is hardly surprising that the HellMachine delivers a high system performance. Although 17,855 points in PCMark Vantage is not sufficient for a top rank, the result is still above average. 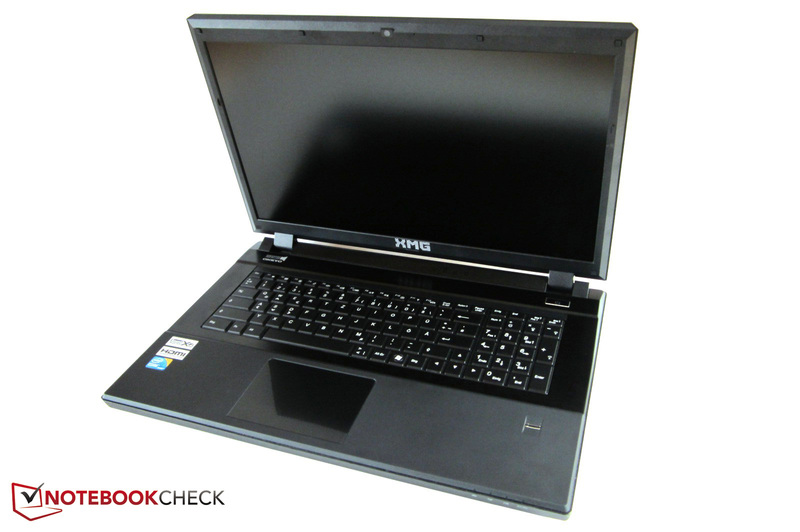 The Toshiba Qosmio X870-119 (17,187 points) and the Alienware M14x R2 (18,158 points) achieved similar results in this test while the Alienware M18x R2 (22,421 points) still maintains the lead. We ran 25 games on the HellMachine for the GeForce GTX 670MX SLI to leave a lot of footprints in our database. With a few exceptions (e.g. Dirt Showdown) the second graphics card was always active and provided a huge improvement. Most of the titles ran about twice as fast in SLI mode. Summarizing over all games, a single GTX 670MX is about 66% slower in ultra settings (1920x1080, maximum graphics details). 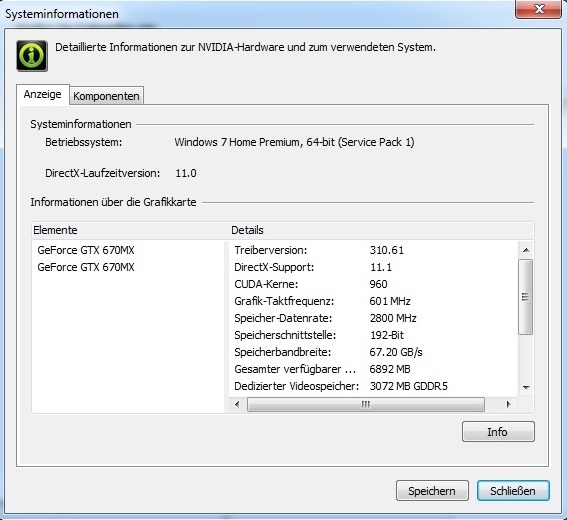 Two GeForce GTX 680Mk are only about 40 % (Schenker XMG U702) to 50 % (Schenker XMG P722) faster than a single one. Speaking of the GTX 680M: Depending on the game, Nvidia's premium model can be faster or slower than the GTX 670MX SLI. There is no clear winner. As the two are about equally fast and the GTX 680M costs nearly 200 Euros (~$263) more, price-conscious gamers should definitely consider the SLI combo. 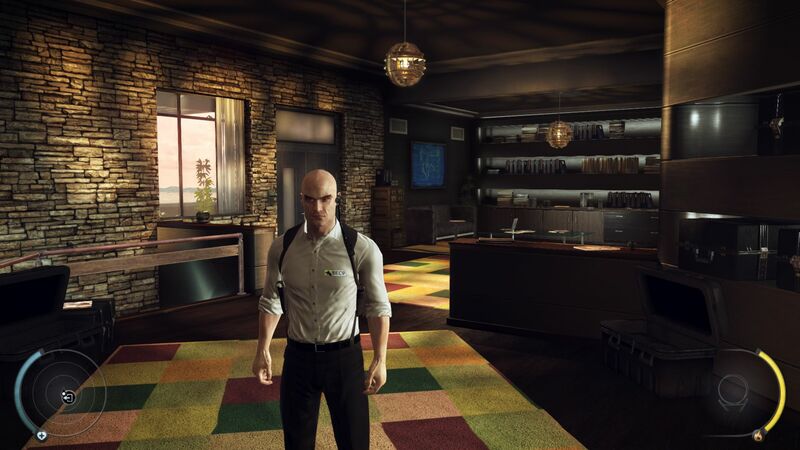 Nearly all titles run without stuttering with a second GeForce GTX 670MX in maximum details. Sometimes there are even reserve capacities for high-quality anti-aliasing. You'll find a detailed table at the end of the article. 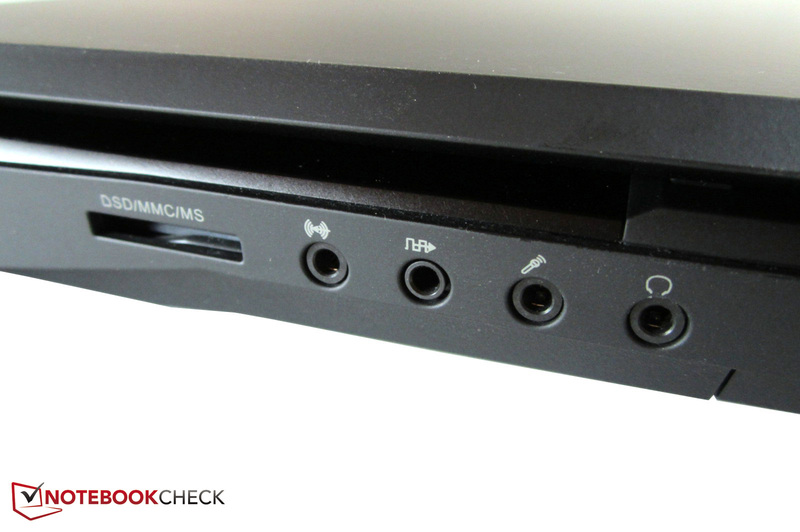 The noise is typical for high-end laptops: acceptable while idle and clearly audible under load. 43.4 dB (A) during 3DMark06 is a bit quieter than the identical Schenker XMG P722, which reached marginally higher 43.8 dB (A) with a GeForce GTX 680M SLI solution inside. 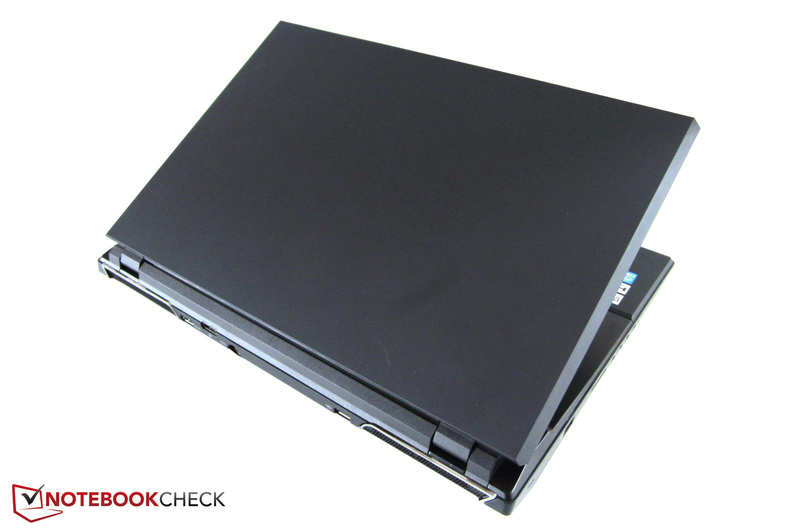 If the notebook only runs undemanding tasks or is idle, the three case fans sometimes turn off completely, but not always. In between, the fans accelerate and become fairly loud without reason - a sharp contrast to the silence. Clevo should definitely improve the fan control a little bit. We would prefer a constant, moderate noise level. The typical gamer will find the noise tolerable. Considering it is a gaming notebook, the case temperatures are surprisingly low. 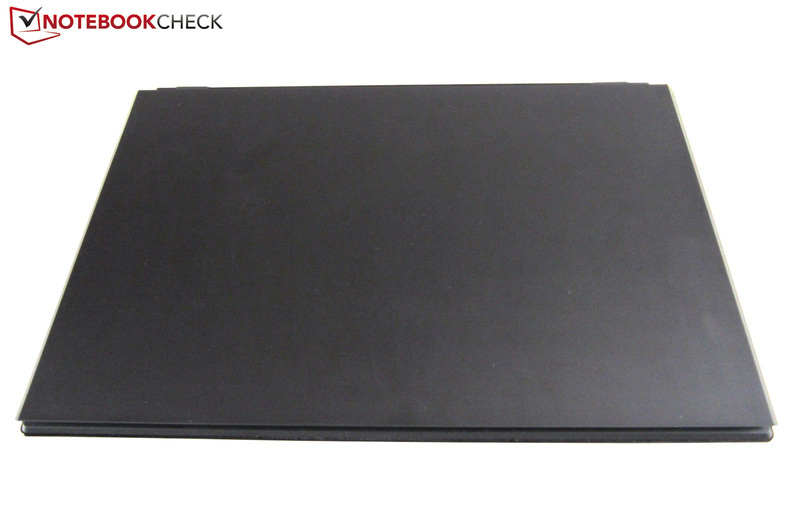 Even under stress we only measured 30 °C (86 °F) on the keyboard side and 29 °C (84.2 °F) on the bottom side. The Schenker XMG P722 reached 36 °C (96.8 °F) on average. While running office or Internet tasks the 17-incher remains pleasantly cool. Left running idle for two hours, the HellMachine leveled out at a lukewarm 26 °C (78.8 °F). Inside the case: no rude surprise. The temperature of the Core i7-3630QM increased to nearly 90 °C (194 °F) (CPUID Hardware Monitor) in the stress test, but this is not yet a critical level. At the end of the stress test the Nvidia GPUs reached temperatures of 80 and 60 °C (176 and 140 °F), while the GTX 680M in the Schenker XMG P722 exceeded 90 °C (194 °F). (+) The average temperature for the upper side under maximal load is 30.4 °C / 87 F, compared to the average of 32.9 °C / 91 F for the devices in the class Gaming. (+) The maximum temperature on the upper side is 35.2 °C / 95 F, compared to the average of 39.3 °C / 103 F, ranging from 21.6 to 68.8 °C for the class Gaming. (+) In idle usage, the average temperature for the upper side is 26.2 °C / 79 F, compared to the device average of 32.9 °C / 91 F.
(+) The palmrests and touchpad are cooler than skin temperature with a maximum of 28.7 °C / 83.7 F and are therefore cool to the touch. (±) The average temperature of the palmrest area of similar devices was 28.7 °C / 83.7 F (0 °C / 0 F). 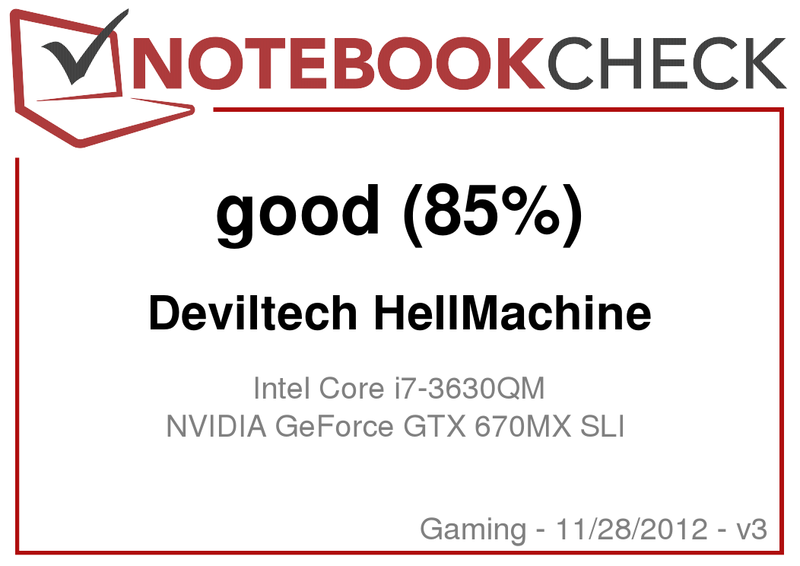 Compared to the Schenker XMG U702 gaming fireball (Clevo P570WM barebone) recently reviewed, Deviltech's HellMachine seems almost frugal. The 17-inch high-end competitor powered by a very fast desktop CPU and two GTX 680M graphics cards requires about +100 % energy. While the Deviltech model needs about 116 Watts (average, 3DMark 06) and 191 Watts (maximum, full load) the counterpart from Schenker requires 219 and 440 Watts. 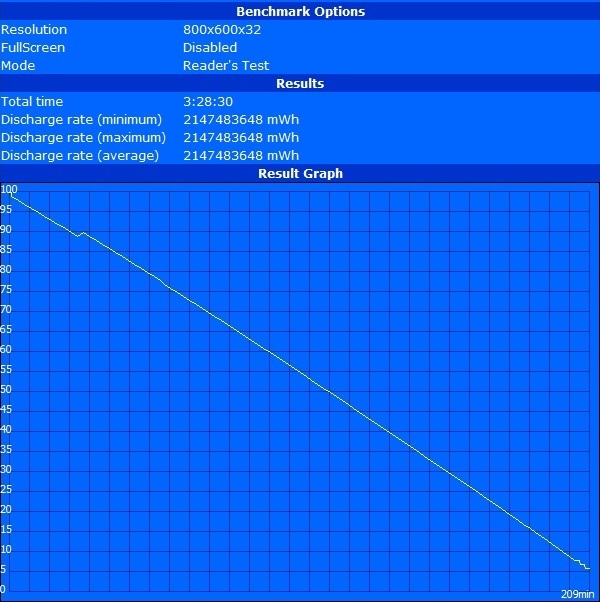 The differences are also huge in idle mode (28 - 40 Watts vs. 67 - 83 Watts). 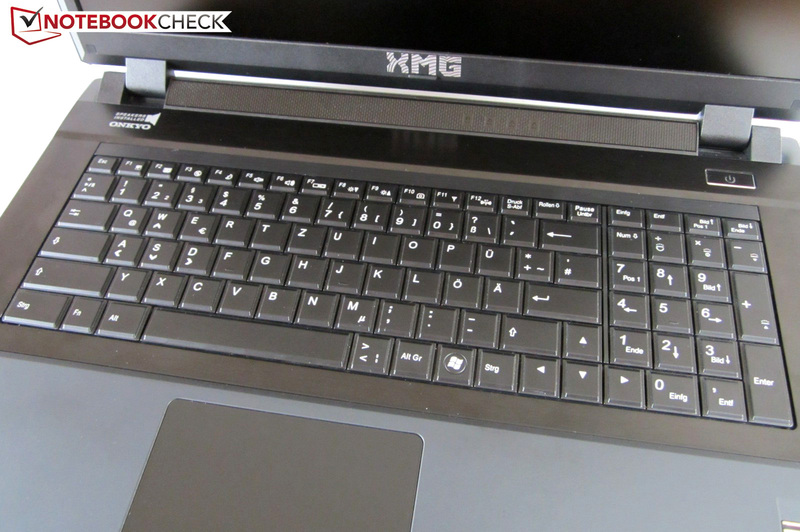 The reason for the slightly lower values of the XMG P722 could be the deactivated keyboard light. All measurements of the HellMachine were done with SLI. 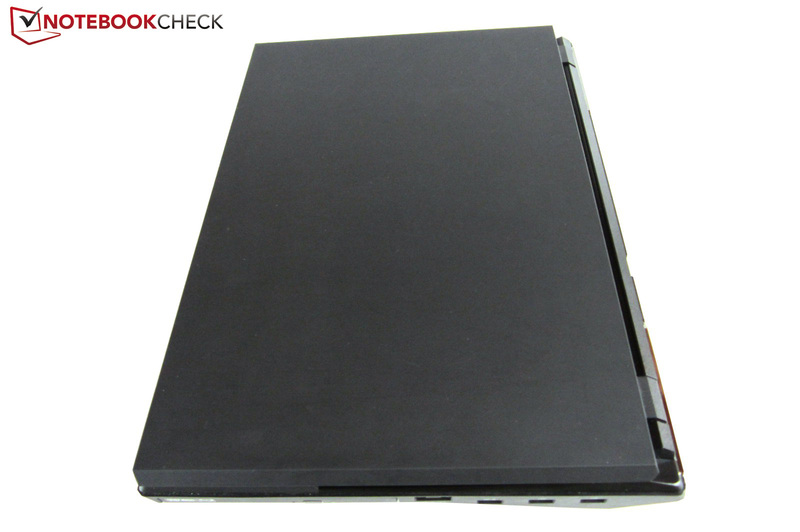 Although the laptop comes with a powerful 8-cell battery, the battery runtimes cannot convince. 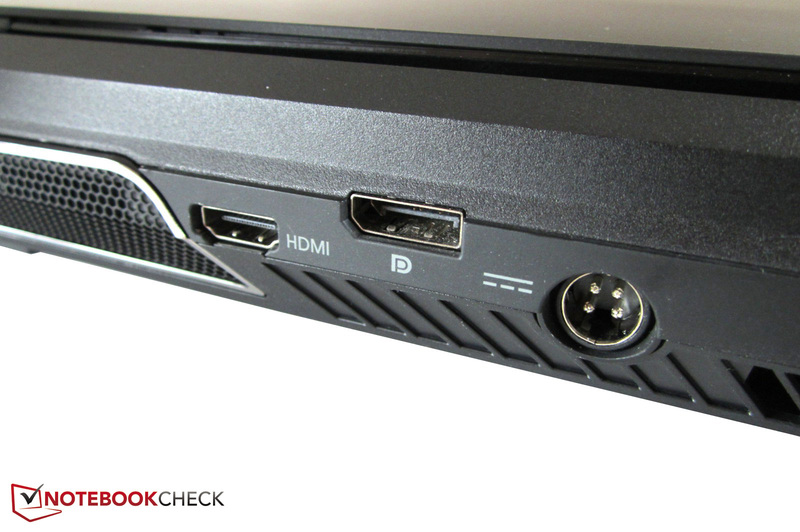 Depending on the load and the display brightness, the 17-incher only runs 1.5 - 3.5 hours. The Asus G75VW and Samsung 700G7C deliver equally poor values. High-end laptops which only contain a single GPU and use Nvidia's Optimus technology can be used significantly longer away from an outlet. 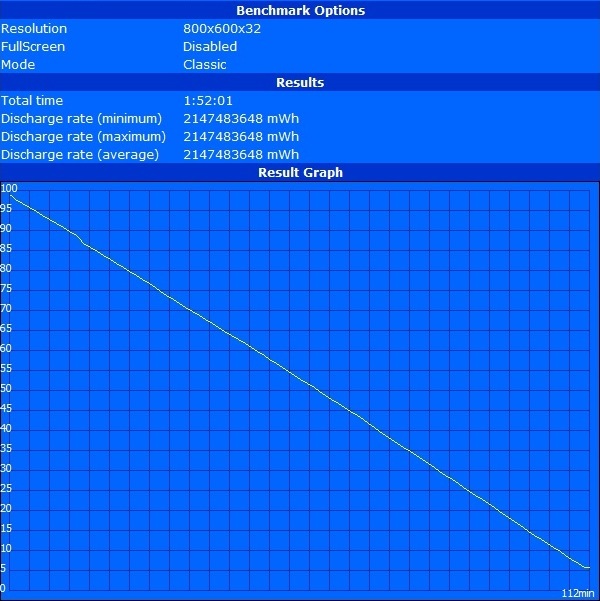 The battery life of the MSI GT70 exceeds 5.5 hours under ideal conditions. With the 17-inch HellMachine, Deviltech sell an extremely fast desktop replacement. 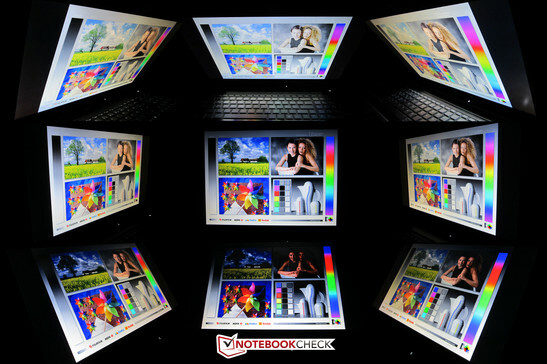 Due to its quad-core CPU (Ivy Bridge) and two gaming graphics cards (Kepler) the notebook outperforms nearly all competitors. The case is decent too. In addition to the lit keyboard we appreciate its rich connectivity (4x USB 3.0!). The high-end non-glare panel, the decent sound and the rather cool surfaces are further pros. However, the HellMachine does not really win fame in the system noise, battery life, touchpad and power consumption categories. Because of its high weight (about 4 kg/~8.8 pounds) and big 300 Watt power adapter, the 17-incher is primarily designed for stationary use. You might be willing to ignore the weaknesses as there are many upgrade and maintenance options. In our opinion 1637 Euros (~$2155) is a reasonable price. All pictures on the right column stem from Schenker's XMG P722 PRO. The keyboard includes a configurable 3 section light. 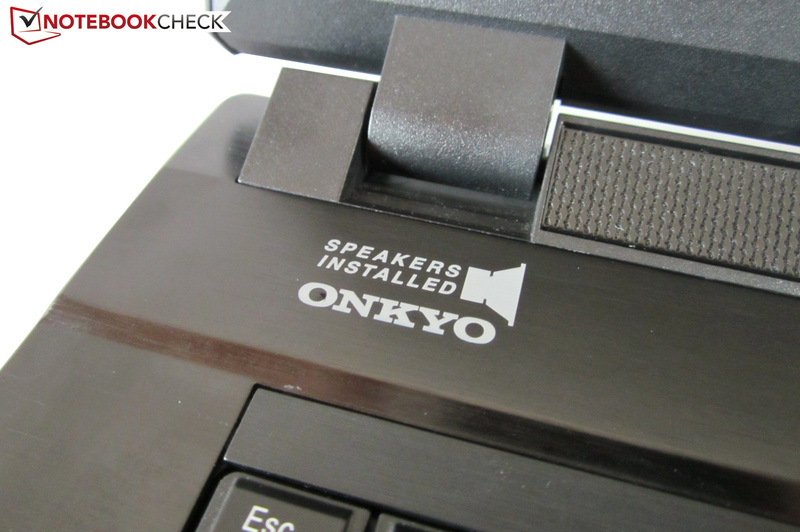 Clevo use speakers from Onkyo. The sound quality is above average. 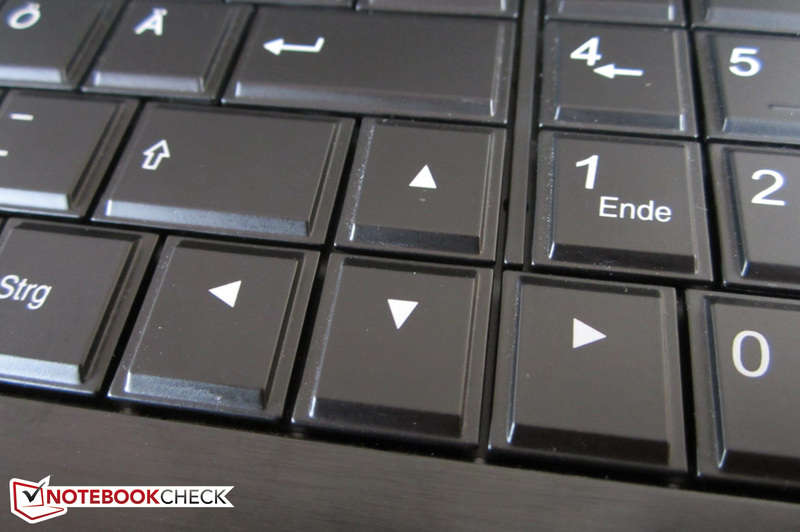 The enter key is also single-row on the German QWERTZ keyboard. 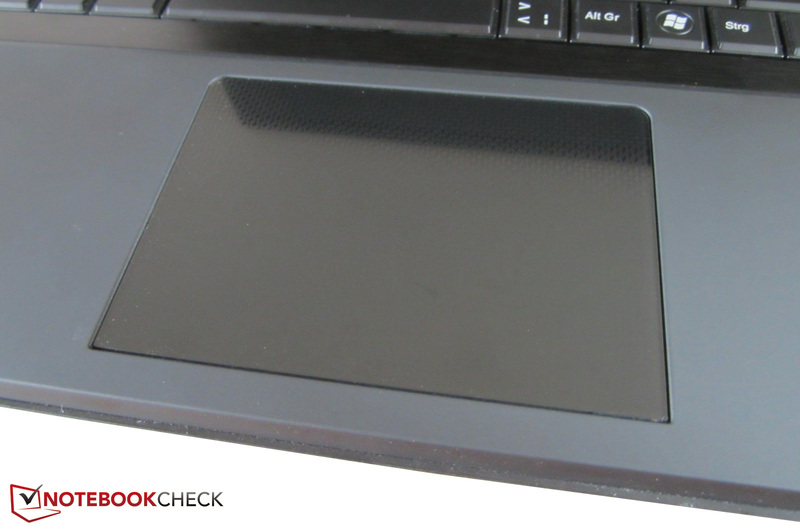 The glossy touchpad works rather poor in practice. Kensington Lock and RJ-45 Gigabit LAN. 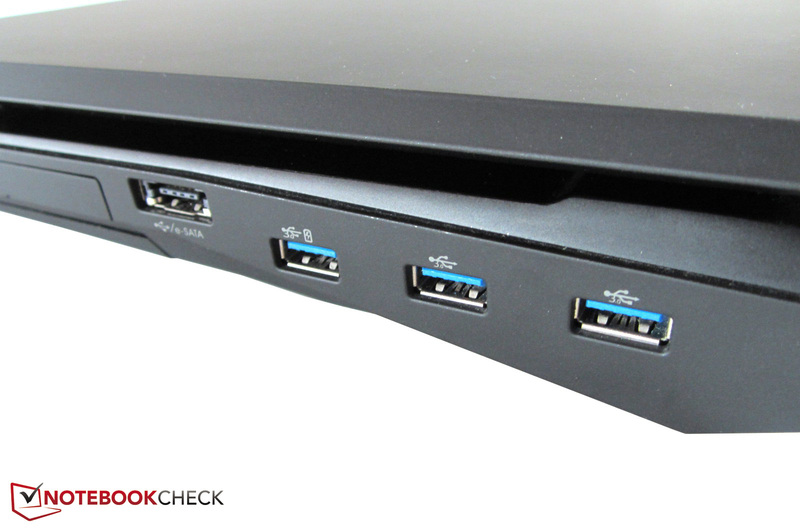 One of a total of five USB ports. eSATA/USB-2.0 combo and 3x USB 3.0. A web cam is obligatory. The shape of the heat pipe is interesting. 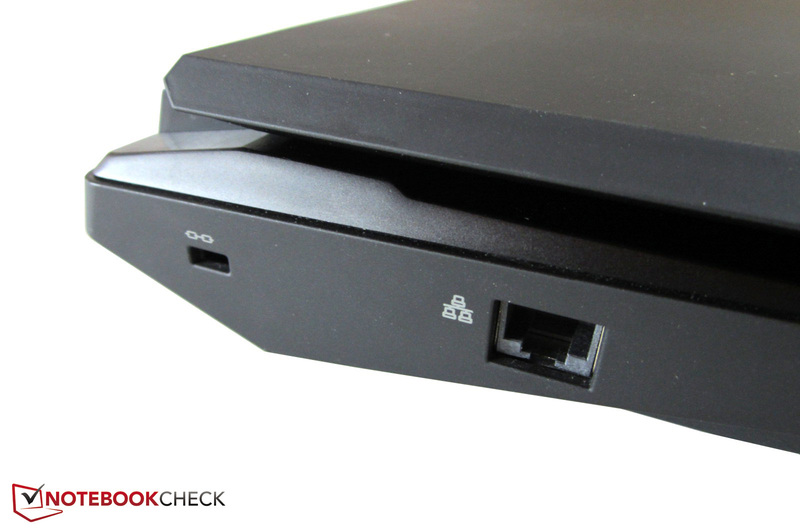 The Clevo barebone is labeled P370EM. We like the build quality. The manufacturer uses a matte FullHD display. The edgy lid is covered by a rubber coating. The maximum opening angle could be somewhat larger. Greasy fingers quickly cause finger prints. The maintenance covers can be easily removed. 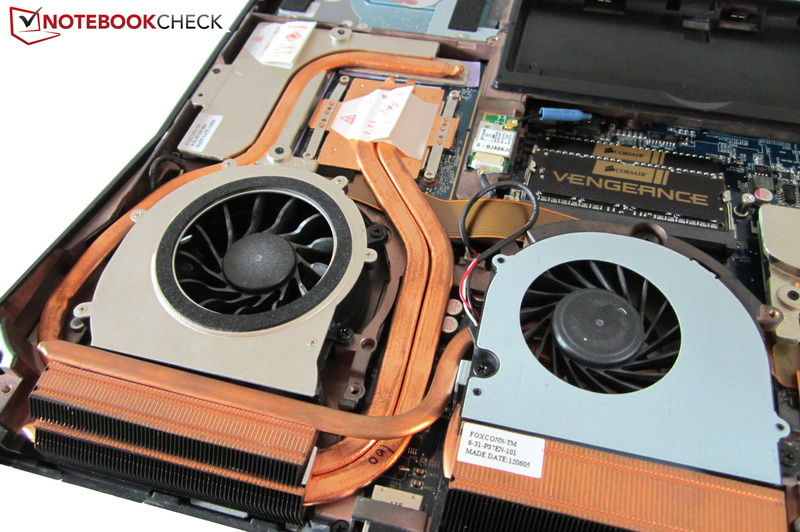 Three fans are responsible for cooling. In theory, it is possible to replace the graphics card. Two of the four RAM slots are beneath the keyboard. 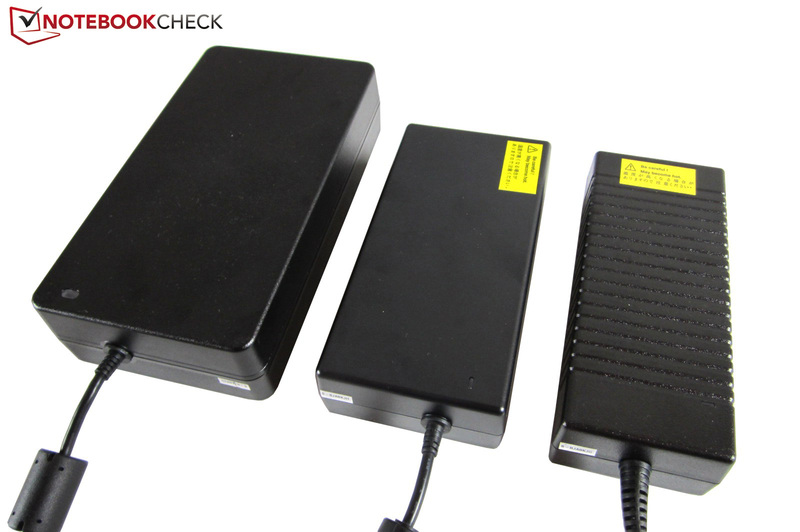 The 300 watt power adapter (left) extremely big. Two GTX 670MX cost less than a single GTX 680M. 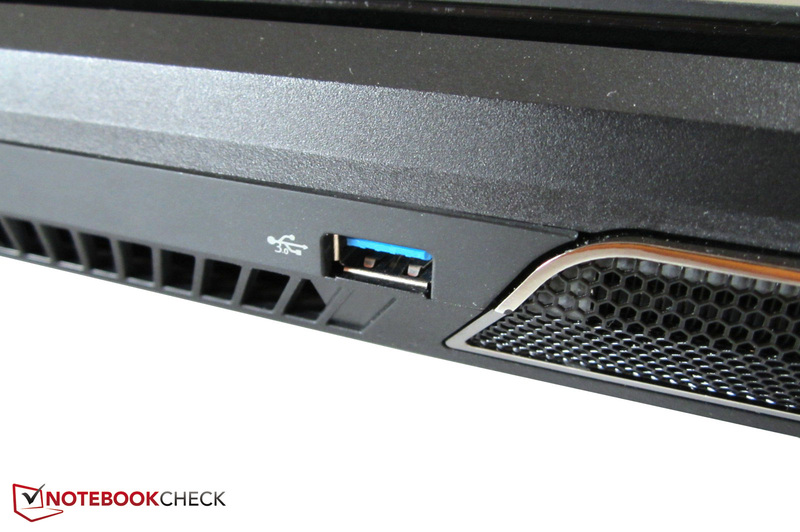 The Schenker XMG U702 and the Alienware M18x R2 are probably the toughest competitors.